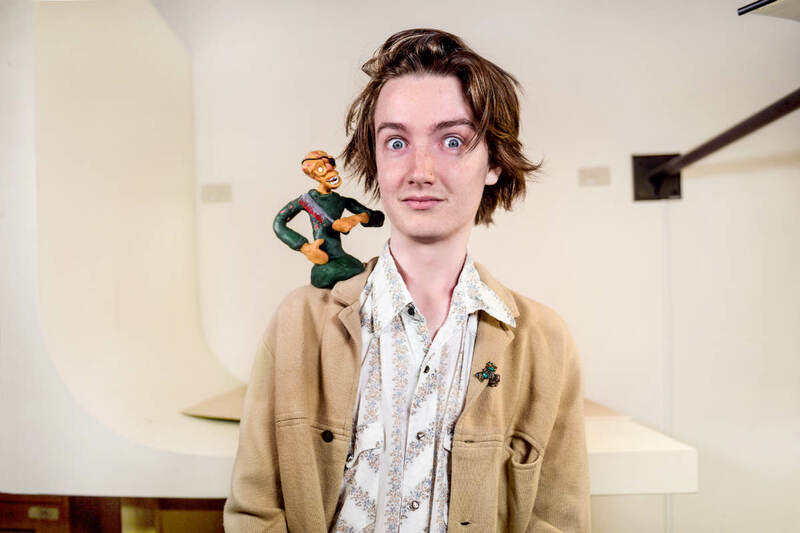 Second year Animation student Willem Kingma already features at animation festivals around the world. He talks with Susanna Ling about being a storyteller, his artistic inspirations, and waking up with The Beatles. I’d always liked the idea of going to the VCA. I’d been to a few Open Days to check out the film and animation studios, and being able to see where I might be working was really inspiring, especially knowing that in the Animation degree you’re given the opportunity to work in one dedicated space throughout the entire course. In the year before applying, I just kept making things I could potentially show in the interview. A day typically starts for me by listening to The Beatles to wake me up and get my brain thinking more creatively. Class usually consists of lots of animation exercises and mini projects, which ranges from meticulously working away on complex bits of animation, to playing Mr Squiggle on the whiteboard. The beauty of having our own studio to work in is that, once class is over, we can hang back and keep working away or, like I usually do, spend time just decompressing by drawing or working on your own personal animation bits and bobs. I draw a lot of inspiration from artists such as David Lynch, Daniel Johnston, Adam Elliot, Wes Anderson, Jean-Pierre Jeunet – the list goes on … But overall, I’m really attracted to stories about individuals whose lives are built up by the strange, weird, wonderful and broken. Life in general is made up of those things, so I guess animation and film is just a great way for me to draw from, and then expand upon, my own life experiences. Animation by nature is a tedious and time-consuming process, and at times that can be quite daunting. The biggest challenge, though, is actually having to deal with your inner critic, especially when it comes to coming up with new ideas and stories. I guess that’s why it’s a good thing we’re encouraged to share the majority of our work and exercises to the rest of the class. It’s a good time to either clarify or quell any concerns I have with my work. I decided to study at the VCA was because I knew I would be given the freedom to explore my creative endeavours with little to no restriction. I was also really inspired by the fact that VCA Film and Television puts such strong emphasis on the idea that a flashy film or animation that looks seamless is absolutely nothing without a compelling story. I came to the VCA because I wanted to become a better storyteller. The freedom is what I enjoy most about my study. There’s definitely a sense in the course that you are not being forced to go in any particular direction. We’re given the opportunity to explore more traditional forms of animation like stop-motion, as well as digital animation. Whether you want to go down a commercial path or down an experimental or individual path, your choice of direction is never compromised. Everyone’s got their own thing going on, and it’s great seeing how others approach the same given tasks. Last year, my short film A Kiss in the Darkness was chosen to be shown at the Animation Nights New York festival, as well as at the Melbourne International Animation Festival 2018. Working on my own short films has been the real highlight of the course so far. Over the next few years, I just want to keep improving my story writing skills, round out my technical skills, and keep trying to get my work out there more through festivals. I’m really looking forward to having a collection of work from this point in my life that I can look back at in the future. The VCA has really strengthened in me the resolve to follow my heart, and create work that is true to myself. In this course there is such a prominent focus on creating art without letting it become compromised by conceived notions of what people want to see. I have no idea if this mindset will lead to a successful life as an artist, but what I do know is that it has helped me not only to enjoy the outcome of my work, but the process as well, and I guess to get anywhere in life it’s a lot easier if you love what you’re doing. It’s great working on my own short films, but I also love making music videos. For me it’s been one of the greatest forms of collaboration, because you’re given the opportunity to interpret another artist’s work visually. In terms of idea generation, making music videos has been crucial in expanding the depth of my films. I just recently finished up working on a video for my mates’ band Bones and Jones and we treated it as an opportunity to work with Super 8 film, explore a bizarre location, and see what we could achieve with a very loose idea of what we wanted to film. We just came up with ideas on the go. To other budding animators I’d say: stay true to yourself and just keep making things! Anything! Music, paintings, stories, drawings, sculptures – it’s all art and it can all be funnelled into the form of animation in one way or another, even if it’s just in the form of inspiration. And to reiterate what I said earlier: a flashy animation or film is nothing without an engaging story. Make things and write things. Drawing has always been a great way of unwinding for me, especially doodling, because there’s no pressure to draw anything in particular. It’s just a stream of consciousness, really, and every now and then I get some cool ideas from it. Music is very important to me as well. I don’t play piano that well but it’s nice to have a noodle and work out songs. Banner image: Willem Kingma. By Giulia McGauran.